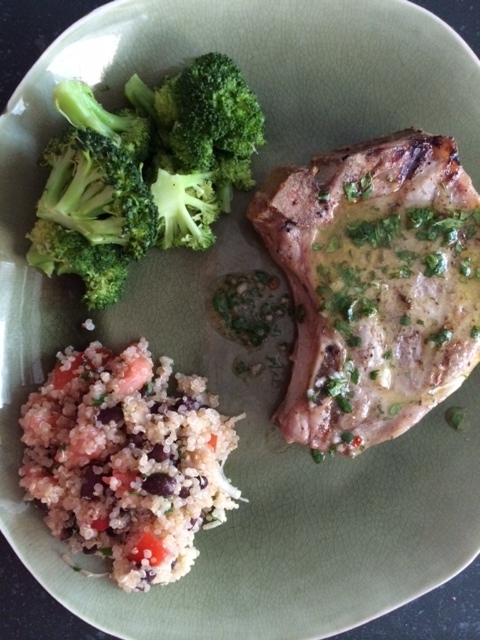 Grilled Pork Chops with Garlic-Lime Sauce | Om nom nom! So…brine these bad boys. You’ll be glad you did. I would suggest brining for a couple of hours, then send the chops straight to the grill. You can season with pepper, but not salt. Worth the minimal extra effort!! For the rest! Whisk together lime juice, garlic, red-pepper flakes, and 1/4 teaspoon salt, then add oil in a slow stream, whisking well. Whisk in cilantro. Prepare the grill. Grill pork chops, covered, turning over once, until just cooked through, 5 to 6 minutes total. Serve drizzled with some vinaigrette, and with remainder on the side.